Discussion in 'Announcements' started by Djupfryst, Dec 10, 2017. And, as always, we've got some big plans. We'll have events running in multiple games throughout the entire weekend, with lots of fun competitions and prizes. Warframe will not have any special event we will just have a fun night and play the game. If there is a boss that you want killed or any resources that needs to farmed, Friday will be a perfect opportunity for this. We are starting around 18 UTC and ending when we feel like we have enough of Warframe for one night. The only thing you need for this is to join us on TS in the Warframe lounge I will be there with a beer in hand. Ps. answering @GoldenIris's questions is voluntary even if she might suggest otherwise. Come join us for 2 hours of Star Gitizen Ship Racing, Bike racing across Yela, and Star Marines. Saturday, December 16th - Trident's Birthday Movie Night Spectacular Best-Of Marathon! It's finally here! This has been in the works for some time, and I think you'll all enjoy it! This Saturday, we'll be revisiting some of the very best and funniest movies we've seen this past year, and we'll also watch one or two new ones! 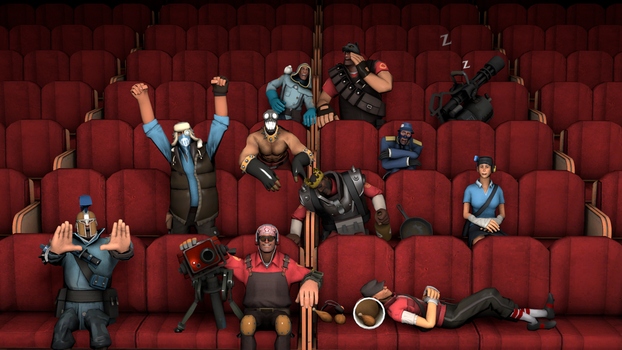 We start at 18:00 UTC, and we'll go for however long it takes, watching five (maybe six) movies in total! It's a celebration of this wonderful and surprisingly successful event. I still consider myself very lucky that I'm actually able to do this, and this is my way of thanking (and/or punishing) you for making it happen. Which, come to think of it, is the point of all these celebrations! But this is more than just a trip down memory lane. By showing some of the very best this "genre" has to offer, I also hope to introduce many new people to the wonders and charms of the world of 'so-bad-it's-good'! So if you've never joined before, this would be the perfect time to do so! Prepare for a day full of fun events, competitions, and prizes! We'll have several big events running throughout the day. In-between those we'll run Party Platoons where we'll do whatever we feel like! We can pick something from the list of smaller events in the 'Event Details', or we could do something completely different! During the entire weekend, we will be hosting a game giveaway on the forums. All you have to do is post something in the giveaway thread between Friday 17:00 UTC and Sunday 23:00 UTC and we'll pick 5, yes 5!, random posters who will win a game! No ifs, no buts, just post something and you can win something! Pithekos, DeusUK, Alex2761 and 3 others like this. It seems sensible to highlight which version of SC is planned for? 3.0 is realistically the only option for this type of matchmaking, and it isn't in everyone's hands yet. There's also a chance it won't to be available by that time frame (although that could change). Today we'll also be having an ARK event at 14:00PM and a Star Citizen event at 16:00! Just hop in the respective channels on TeamSpeak to join! Welp, how did the SC event go? Well, everyone, I had so much fun throughout the entire weekend! So I'd like to thank you for taking part in the celebrations and for making all these events so successful! I'll make a post in the Movie Night event thread summarizing that as well. Now, If you've got any screenshots, videos, or stories to share from any of the events, please share them with us in this thread! Also, just as a reminder, if you happened to win any competition, make sure to send Ice247 a PM on the forums in order to get your prize!